Again there appears to be little obvious information to go on. However, the experts continue to surprise. So what is the train, when is it running and at what location ? The shadows show that the train is travelling South in the afternoon, and the third vehicle is a Post Office with letter sets on the offside. The first vehicle is 30ft 1in five-compartment van, second is a 42ft 0in composite. Fourth would seem to be a 26ft 0in or 30ft 0in flat-side brake van. My guess is the Crewe � Euston Day Mail (Crewe depart 3/00, Euston 6/25). If so the TPO carriage is No.3, a 32ft 0in vehicle to D.402 built in 1887, and the only one of this Diagram. Its appearance tallies with the photo. The engine would appear to be an �Experiment� 2-2-2-0. Date must be c.1898. Location � double track so on a now-unrecognisable section of the Trent Valley Line. The locomotive shown has only the large bore ejector pipe with the handrail mounted upon it visible along the right hand boiler centre line, so is almost certainly a "Dreadnought" compound. The "Experiments" had the large bore pipe in the same position, but carried their handrail/ blower valve control rod separately higher up the boiler side, ending at a noticeable valve on the smokebox side. As there is absolutely no sign of this higher rail and valve in the photo, and along with other features which rule out "Teutonics" and the varieties of 2-2-2-2, I conclude that only the "Dreadnought" locomotives fit the image. Yes, you are quite right � a Dreadnought. In 1895 the Up Day Mail used apparatus at Bletchley, Leighton Buzzard, Tring, Berkhamsted, Boxmoor, Watford and Harrow. It conveyed letters only � no parcels. In 1900 the TPO was replaced by a new 50ft 0in vehicle No.36. The train ceased to run after 30th March 1918. The plate girder bridge in the background seems to have enough space to span four tracks, in other words has been installed preparatory to widening. If so, that rules out Rugby � Roade. 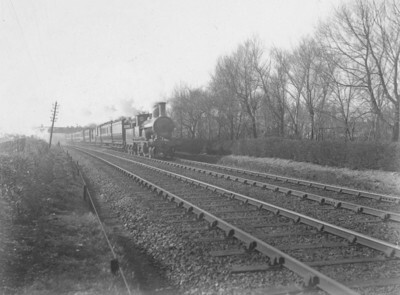 Although it is very much a guess, I think that the location might be between Colwich and Rugeley, before the widening of 1903, near milepost 125. Such a plate girder bridge existed North of Rugeley, and according to E.Talbot�s book �Railways In and Around Stafford� the location was easily accessible to photographers from the adjacent road. That was probably important in view of the equipment required for photography c.1900.